We have very few traditions when it comes to the holidays. Blended families lends itself to, let’s just say…a lot of “flexibility”! I didn’t grow up with traditions around the holidays either, except one, making candy! Every year since I’ve started blogging, I keep thinking I’m going to share my simple old fashioned candy recipes that have been passed down for a couple of generations. Then I get too busy and forget. Made in about 20 minutes! 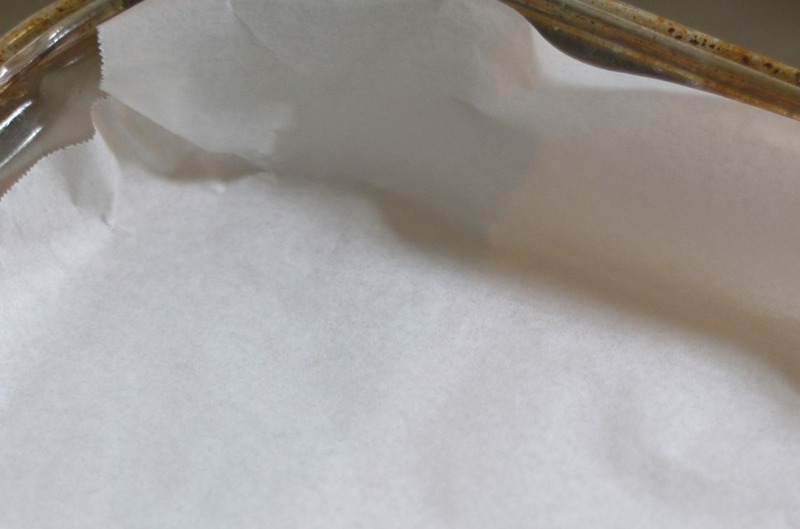 If you are a beginner Candy Maker this is thee place to start, so simple! 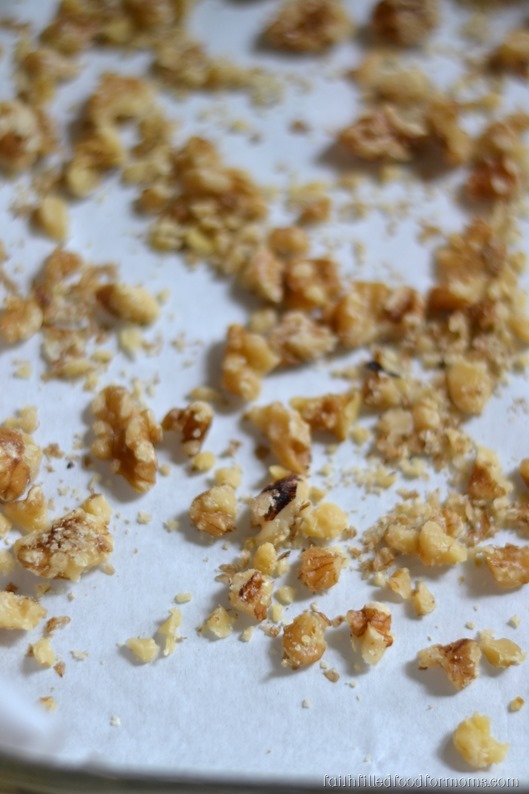 If using nuts, chop them up and sprinkle in pan that you will be using. Bring to a low boil for 6 minutes. You must stir constantly! The brown sugar and butter will go through a couple of stages while boiling, this is normal. It will start to pull away from the side of the pan when it’s nearing the time to remove from heat. 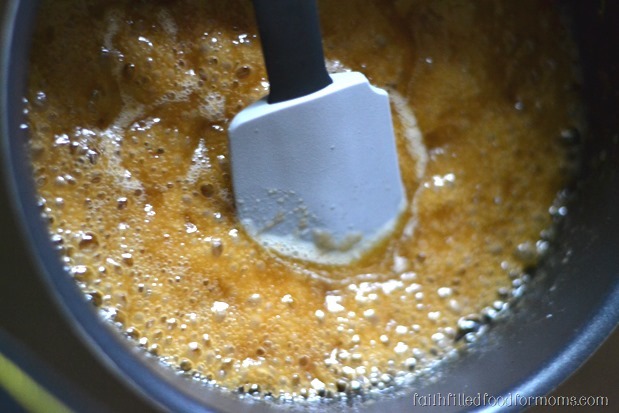 If your mixture starts smelling like it’s burning, remove from heat…it’s done. Carefully spread around a little if needed. Now cover your dish for 1 ~ 2 min. with anything. I use a cookie sheet over my pans. 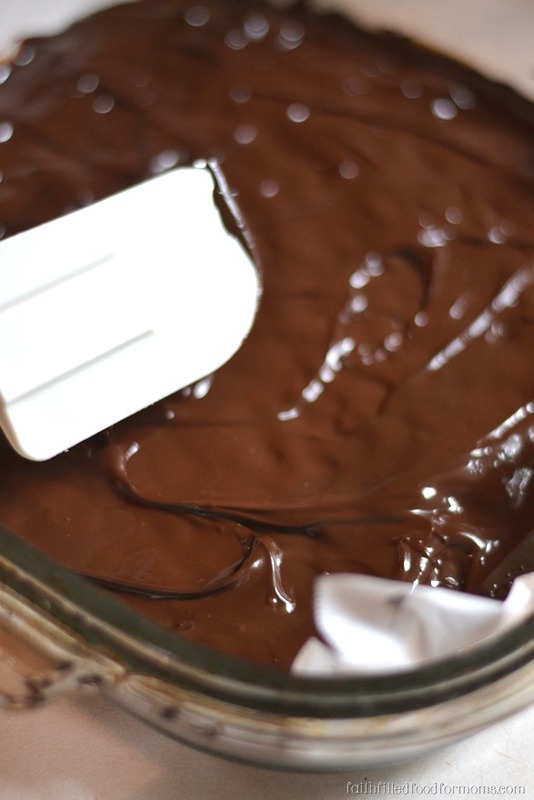 This will hold in the heat and allow the Chocolate Chips to soften super fast. I like to put mine into the frig for about 5 minutes so that the chocolate hardens faster. Break up into pieces and eat! This makes a super sweet and quick gift for neighbors, co workers, teachers, hostess’s…well anyone!! I’ve loved putting Homemade candy into Mason Jars forever and now they come in such unique fun shapes and sizes! LOVE! 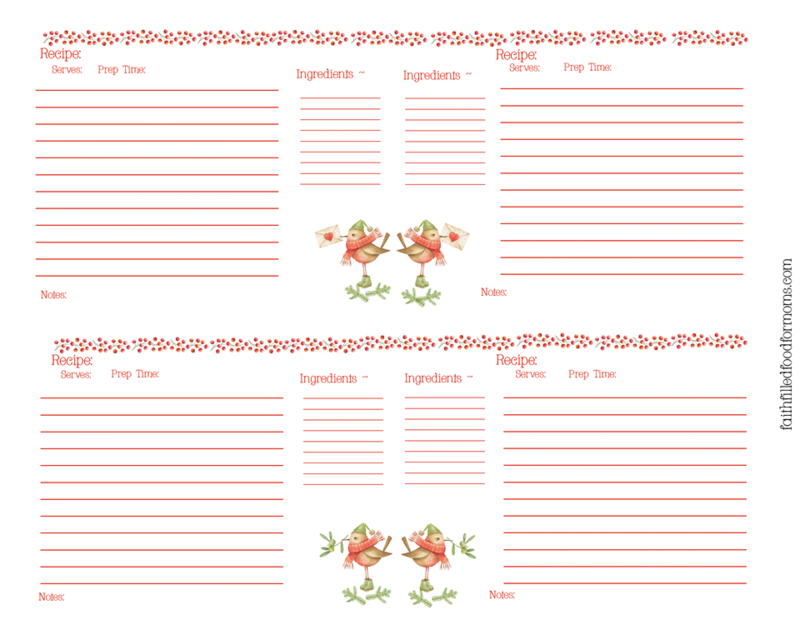 You can use this pretty Christmas Recipe Card too if you would like to give your Toffee Crunch as a gift! we LOVE making toffee, and the simplest recipes always turn out the best! What size pan do you pour it into? Hi Emma! You can use a 9×9, 10×10, anything about half the size of a 9×13 😀 Enjoy and thank you for stopping by! Blessing! Thank you for this recipe; I can’t eat nuts so this will be great. Yes still definitely great without nuts of any kind 😀 enjoy and thank you for stopping by Emma! Blessings! YUM! I can’t get enough toffee. And having some ready in 20 minutes?? Heaven! Can’t wait to try this! 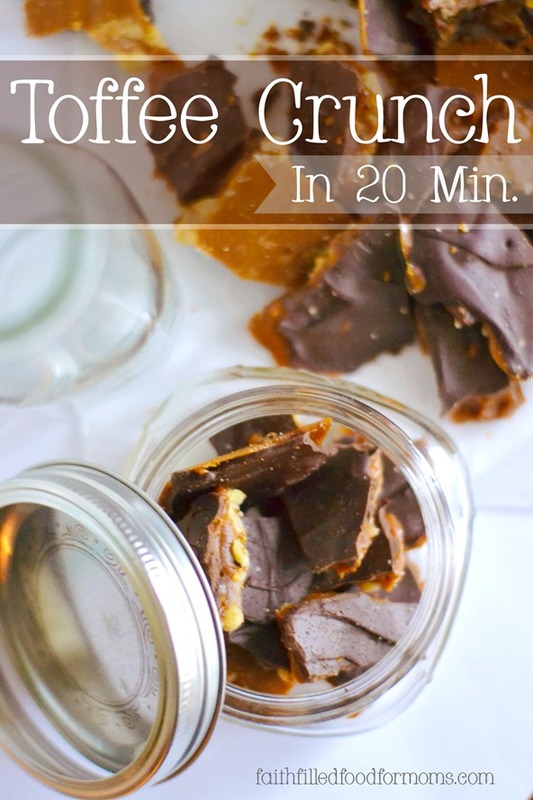 Great recipe…I love toffee. Visiting from Inspire Me Wednesday. I also started following you on FB. Hi Shari, I like the look of this toffee crunch. I may have to add to our Christmas baking list (one of the nice things about Christmas!). I do make fudge every Christmas, but it has been years since I made toffee. Thank you for sharing this recipe, it looks a winner! OMG that looks delicious and sinful. I’d be worried that I’d eat it all myself. Would be a great gift for my girlfriends. Thanks for the inspiration. Stopping by via the Shine blog hop! This sounds soooooo dangerous. 😉 I’m pinning it to try later! This looks incredible! Thanks so much for sharing your recipe. Pinning it to my Christmas board now. Blessings to you and yours this Christmas. 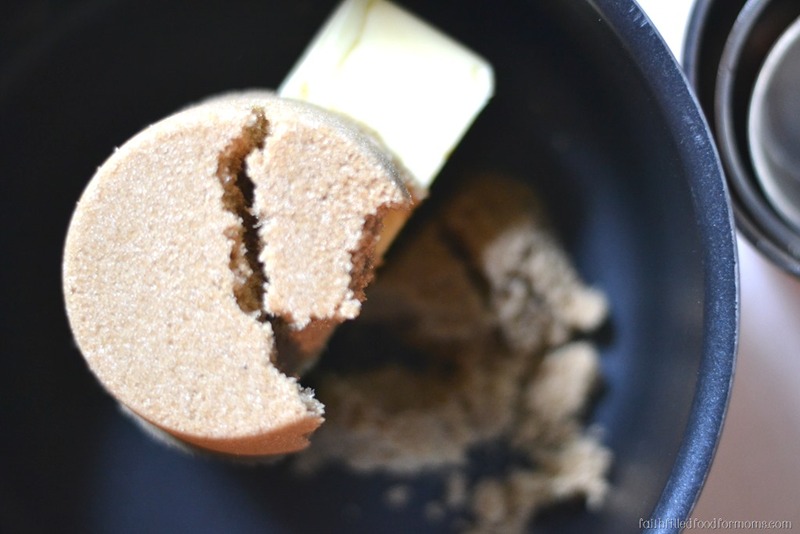 This recipe is perfect… Simple and looks fantastic! Uh, oh! My stepbrother makes this for Christmas every year, and we have to wait to get it. No more waiting!!! Oh my goodness, this looks and sounds absolutely fabulous! I love toffee too. I can’t wait to give this a try! Pinning! And I like toffee so much better than fudge. I may need to give this recipe a try. Thanks for sharing it. That’s a good thing right!? LOL YUM! That looks so good! And easy! I am definitely making this before the holidays! This looks absolutely delicious! 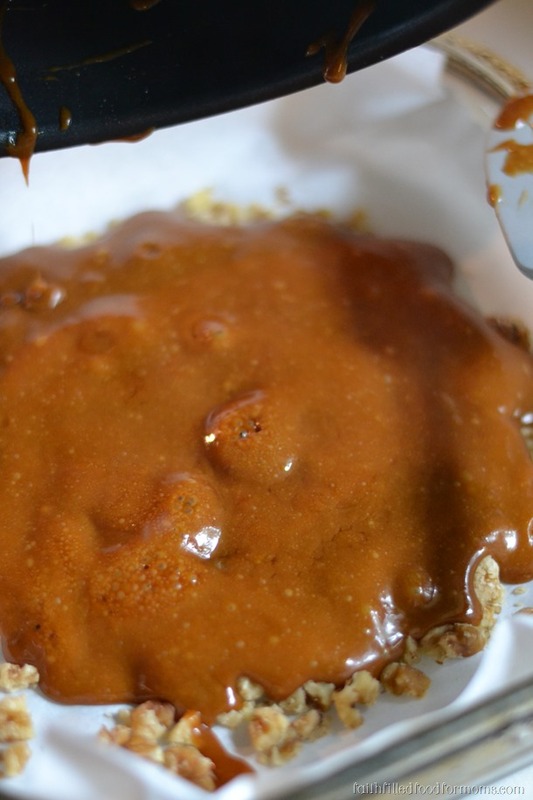 I kind of go in spurts when I like to eat toffee, so I am going to keep this recipe in mind for when I do. Thanks for sharing! 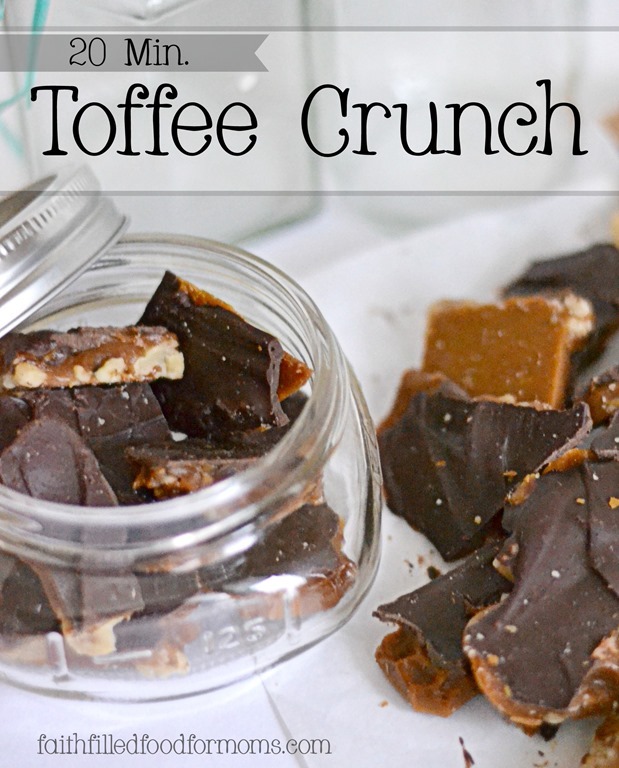 yay–I’m actually looking for a toffee recipe I could try this year–thanks!! Yay! So glad Mitzi and couldn’t be easier! 😀 Have a blessed rest of the week! Oh my goodness that looks delicious! And I think I can find 20 minutes to make some too. I love toffee, its one of my favorite candy. Toffee is one of my favorites and your Toffee Crunch looks awesome! Thank you so much for sharing with Full Plate Thursday and have a great day. Don’t you just love it Miz Helen!? YUM! Thank you for stopping by and have a blessed week! Wow – so delicious and so easy. 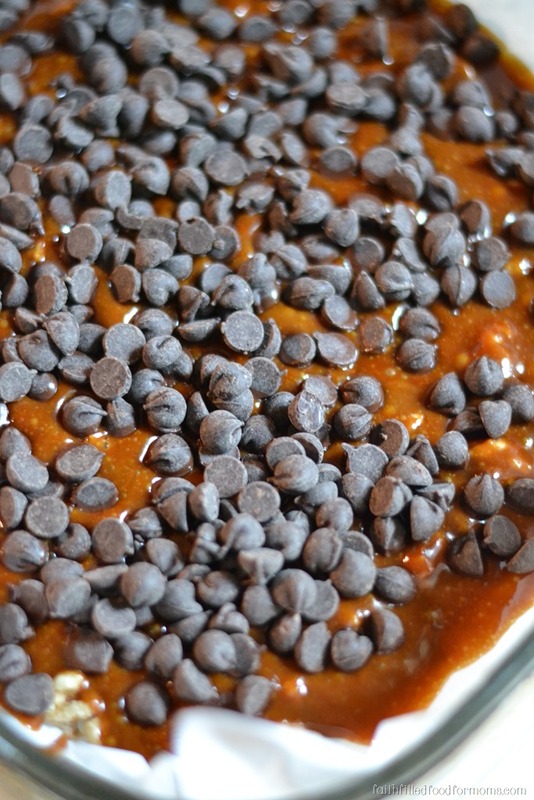 Love me a good candy recipe! Thanks for sharing. This looks so delicious. And so easy. I love a good candy recipe. Thanks for sharing! These look sooooo yummy. I think I would add the salt. I love sweet and salty together. Thank you Heather, I love the salt too! Definitely adds a touch of sweet and salty 😀 Thank you for stopping by! Have a blessed Christmas. Thank you for this recipe !! I have gone through a divorce and am raising my 2 sons age 12 and 15 by myself since June of 2013. (Emotionally and financially by myself!) Although I do understand the true meaning of Christmas is not about the $ you spend, I wanted to be able to give something back to the people in my life, to tell them that I love them. I am not a crafty person, and am not a baker!! But your post said “for the begining candy maker” and I saw that there was no candy thermometer needed and I knew this was for me! Also my 12 yr old loved making this Toffee, and we had fun making it together. A win win in my mommy book! So thank you once again for taking the time to put this recipe out there. And know I appreciate your time, and that you have helped me cross off a line on my ever growing “to do” list !!!! Oh Sara you are the sweetest ever! You are the reason I love to share easy recipes, tips and lots of faith! I was a single Mom for 3 years and I have to say that it was the hardest job I’ve ever had! Thank you so much for sharing your heart and experience. You are an amazing Mom and I pray that the Lord would richly and abundantly bless you more than you can think or imagine this Christmas and beyond. Blessings to you sweet Sara! I am considering making these for a baby shower. How many batches do you think I would need for 40 guests? They look delicious. Thank you! Hi Kelly! Good timing as I was just getting offline! 😀 I would say maybe 3 batches at most unless of course they a real candy lovers. You can break the pieces as big or small as you like. Your guests will LOVE this..and it’s oh so easy. Have a blessed rest of the day and a super fun baby shower! Oh I see…well maybe 4. It really makes a pretty good batch. blessings! I will be filling small paper bags as favors. I have been wanting to make something like this for some time! And perfect for the GF people in my life! 🙂 Thank you for sharing this on the Art of Home-Making Mondays! This almost seems too easy to be true! I know what I am making tomorrow! Thanks for sharing! I thank you for the recipe, I’ve never attempted candy before, this looks like something I can do. It’s so easy Faith! You will love it! Thank you so much for stopping by, have a very blessed Thanksgiving! Looks fantastic! Pinning! One of my favorite treats! Coming to you from #EspressosofFaith via #CoffeeandConversation! Blessings! This looks yummy! Can’t wait to try it!